There’s a major bear market right now—in trust. Or so it seems reading the papers, blogs and broadcast media. The only bull market to be found is the bull market in talking about the bear market in trust. So it’s very appropriate for this blog to have a point of overview. Both the Economist and the NYTimes agree that trust is a Big Deal at Davos this year. Paul Krugman says trust is a big part of the problem. 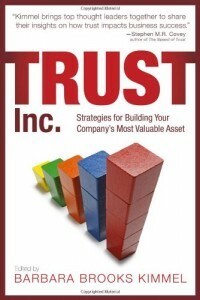 2. at the heart of all trust is personal trustworthiness. A Big Opportunity Cleverly Disguised as a Trust Crisis. The academic research on trust is staggering in the breadth of definitions of “trust.” We trust stoplights, Amazon book reviews, the kindness of (some)strangers, some businesses more than others, neighbors, those we know, those with similar names or facial features or religions—and we trust each in different ways. How curious that, despite our inability to provide a concise dictionary definition, we nonetheless know from context pretty much what is meant when we use the word. Which means, to say “trust is down” is not meaningful without context. Other statements requiring context include “trust takes time,” “trust takes years to build and only a moment to destroy,” and “trust but verify.” All are true in their place—and not so true outside that place. All of which means getting the context right is critical. Trust is Personal. Former House Speaker Tip O’Neill famously said, “all politics is local.” So is trust, in the sense that if is unlinked from people, it loses its breadth of meaning. We don’t say we “trust” that the sun will rise in the East, or that the law of gravity will work every time. We may depend on or predict based on laws of nature; we “trust” people. We cannot afford a society based on 18th century models of a competitive state of nature. We cannot even rely on "the rule of law"–society is too complex. We cannot afford social constructs based on the suspected evil of others–we need models based on values and standards to which we demand people aspire. This is a fundamental truth about trust. In all the debates about institutional trust and the need for regulation, we ignore this truth at our peril. If there is any common message about trust, this should be it. The "trust issue" is not fundamentally about disclosure, or process regulations, or even transparency: at root it is, as it always has been, about the personal integrity and trustworthiness of human beings in relationship to each other. The ubiquitous phrase "attract and retain" is usually considered two-sided. It's not--attraction is more important.